About a year ago experimental work was undertaken at the East Pittsburgh plant of the Westinghouse Electric and Manufacturing Company, under the direction of W. S. Kugg, vice-president of the company, and H. D. James, consulting engineer. 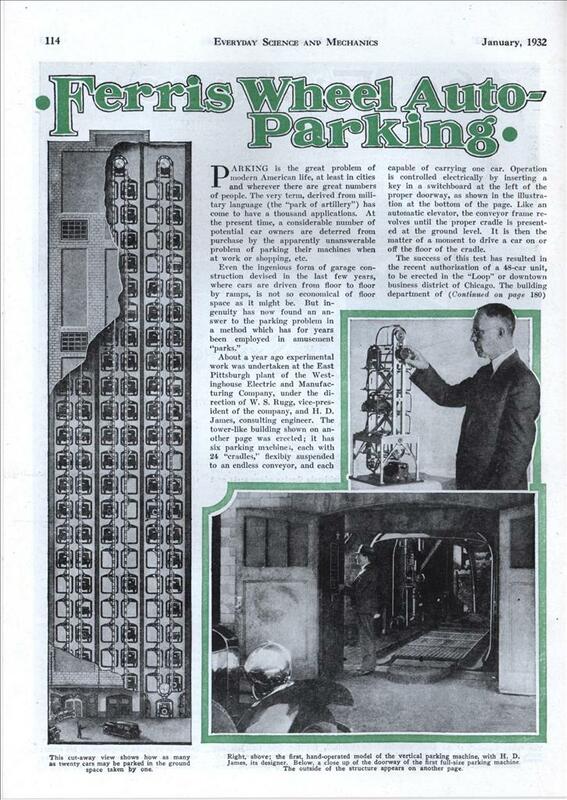 The tower-like building shown on another page was erected; it lias six parking machine;, each with 24 “cradles,” flexibly suspended to an endless conveyor, and each capable of carrying one car. Operation is controlled electrically by inserting a key in a switchboard at the left of the proper doorway, as shown in the illustration at the bottom of the page. Like an automatic elevator, the conveyor frame revolves until the proper cradle is presented at the ground level. It is then the matter of a moment to drive a car on or off the floor of the cradle. The success of this test has resulted in the recent authorization of a 48-car unit, to he erected in the “Loop” or downtown business district of Chicago. The building department of that city has decided that the parking machine, constructed of steel, is not a “building,” in the legal sense; and that the city has the power to utilize streets and alleys, without prejudice to the passage of ordinary traffic, for overhead parking. This new equipment, for 48 cars, will be 105 feet high, and take 32 by 24 feet of ground space; the power is supplied by a 50-kw. motor generator, with variable-voltage control, driving a 75-hp. direct current motor. The cost is estimated at from $1,200 to $1,500 per car unit. It is pointed out, also, that the same system may be applied to an underground installation, if conditions make this more desirable. Such vertical parking machines may be conveniently located in alleys, where the flow of traffic is limited and local. The success of this idea will, undoubtedly, increase greatly the value of cars to city residents; stimulate downtown shopping; and speed up traffic, by clearing the streets of the numerous parked cars which often reduce the lanes of traffic to half their proper efficiency. 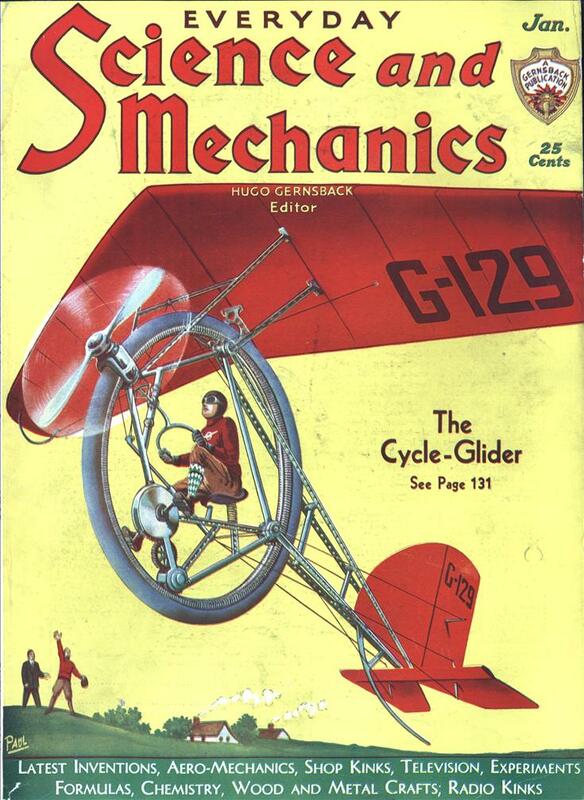 At last, a practical use for Paternoster style elevators! I think this is neat, dosn’t seem practical, but neat. I’ve seen display cases in some stores that work on this principle – there are multiple trays held by chains on both sides, and buttons can bring a chosen tray up to the display position. This seems like a silly idea, but if cities become crowded enough, it could make sense. These re more common than you think these days especially in areas tight on accessible/changeable land (Japan). I’m surprised Seamus that people like Jay Leno don’t have one of these systems to house their automotive collection in.